Posted	 07:44 AM	 by	Irène Cherpillod	& filed under	1. Resources, C. International Initiatives	. 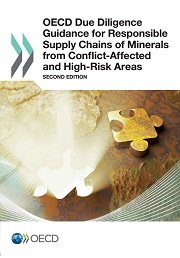 A company sourcing minerals or metals from conflict-affected and high-risk areas has to ensure it respects human rights and does not contribute to any conflict through its activities. The OECD has developed international guidelines on due diligence for companies. 1. Reinforce the due diligence companies capacities, internal systems and record keeping through their chain of custody. 2. Asses the risks of the mines, the transportation routes, the mineral hubs and trading centres and of each mineral/metal suppliers. 3. Based on the risk assessment the recommended measures should be put in place, from stopping immediately all activities to mitigating measures and implementing a successful action plan within 6 months. Risks shall then be regularly monitored within the supply chain. 4. The company should participate in audit programmes, such as iTSCi audits if members or customers of iTSCi members, ICGLR regional certificate or audits according to the Conflict Free Smelter Programme requirements. 5. The company should publish an annual report that outlines the each of the due diligence steps taken and make them public on the Website. Click on the pictures below to access the OECD Due Diligence Guidance. The pilot implementation phase of the OECD guidelines has been successfully worked through within the Africa’s Great Lakes region since 2011. Over 100 companies volunteered to take part to the pilot phase conducted by the OECD, the ICGLR and the UN Group of Experts on the DRC. Each year, an implementation report has been published and shows the best practices and tools to further assist companies in the implementation of the OECD Guidelines. The reports can be downloaded here. 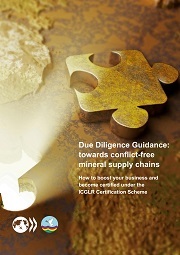 The OECD Due Diligence Guidance needs to be disseminated throughout the widest range of actors within the mineral supply chain (3Ts and gold), governments, industry associations, financial institutions, regional and international civil society organisations to ensure the successful implementation of the guidelines. Trainings on the Internet, so called webinars, have been regularly organised since 2013. Teaching materials are freely available on the Internet. Training webinars and teaching materials on the responsible sourcing of gold. Training webinars and teaching materials for the artisanal and small-scale mining actors in gold activities.